Killer Characters: Tin Penny Toys--and a giveaway! 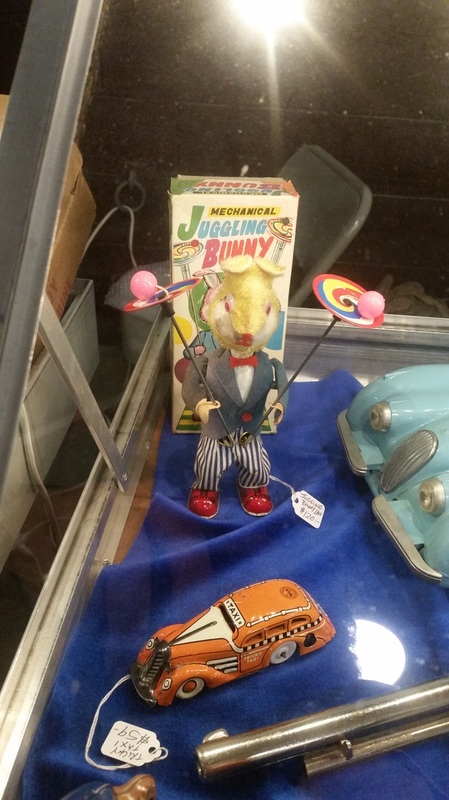 Tin Penny Toys--and a giveaway! Hank McCall here. When I retired from the police force, I wasn’t quite ready to take up porch sitting—especially when we live so close to Buffalo, NY, and that porch could be covered with snow for months on end. So diving into another of my passions seemed appropriate. I’ve collected toys much of my life. It was easier when Parker and Liz were younger. People expect you to buy toys when you have kids. (Unfortunately, they also expect you to give those toys to said children.) Maybe I’m nostalgic, or got bit by the collector’s bug (yes, I’ll take one of everything), but through the years, I amassed quiet a substantial collection of my own. Now most of it is now for sale in our shop, Well Played, along with an inventory we’ve bought from other sources or consigned from those wishing to liquidate their collections. I have mixed feelings about giving up my toys. Sometimes it’s hard to let go. On the other hand, I had no place to display them all, so they mostly sat in cardboard boxes in the attic for years. Now I get to see many of them--and new pieces--on a daily basis. And there’s something joyous being surrounded by toys. One of my favorites are the old penny toys. These are often brightly printed lithographs on tin. Or at least, they were once bright. With the value now, it’s hard to believe these ever sold for a penny. Then again, most were destroyed—or played to death—as my daughter tends to say. I just love to look at them. As if I didn’t have enough of my own, I’ve been watching this video that Miles found online. Aren’t they great? In related news, I think Liz just hid my credit card. Read more about Hank McCall in Death of a Toy Soldier. "The characters are captivating, the plot is well-constructed, the mix of crime and laughter is balanced. Cozy mystery fans have been presented with a charming gift for themselves and their mystery-reading friends this Christmas season. Don’t miss it." 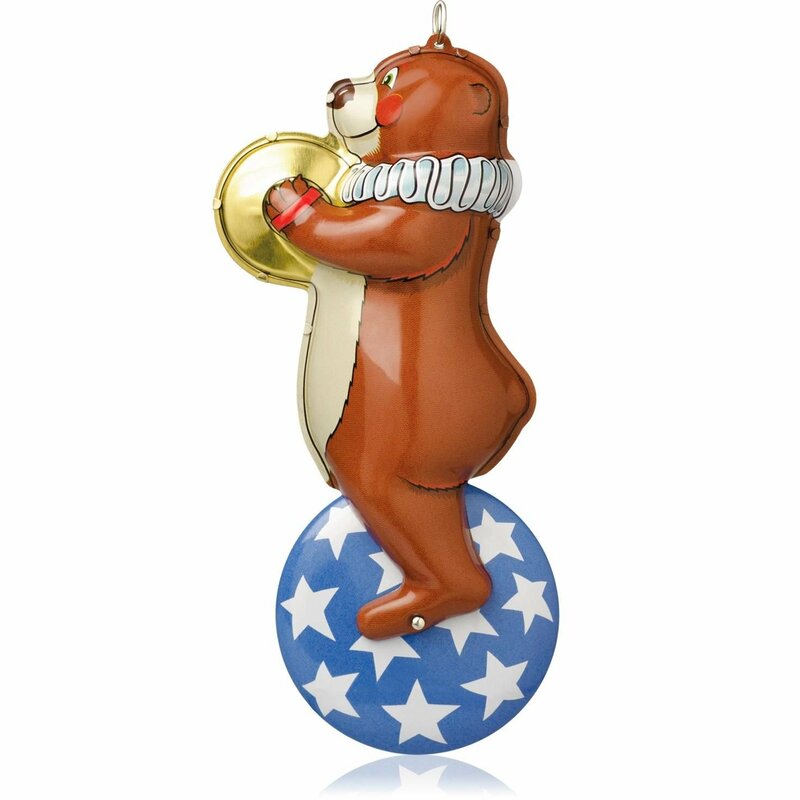 Giveaway: Barbara Early is giving away one Hallmark tin toy ornament. To win, comment below sharing a memory of a cherished childhood toy. (Sorry, US entries only.) Please include your email in a spam-safe format (ie. My Name AT provider DOT com) so she can contact you if you win! Winner will be chosen randomly from eligible entries at noon on October 31st. Sadly, I have no favorite toy nor do I remember a favorite toy when I was growing up. I love all these pictures. We would never get the big seller toy of the year but always something special that my mother just knew was the right thing. And my grandmother would always have some "bricks" wrapped for us - books! sallycootie(at)gmail(dot)com. My favorite toy was a teddy bear. I still have him, my Mom saved him for me. My favorite toy as a child was my strawberry shortcake doll. You squeezed her belly and a puff of scented strawberry came out of her mouth. kt3us at yahoo dot com. I still have one of my most cherished toys. A plush raccoon named Rob. I got him at Sak's of 5th Avenue on vacation in Philadelphia with my parents when I was in grammar school. He still sleeps in my bed with me! A pink dog and a sewing machine a tiny one it's black. Donamaekutska7@gmail.com still have both, the dog and singer sewing machine are from the late fifties. My Teddy Bear. I still have it. I loved my Ginny doll. I saved my allowance to buy clothes for her. I still have her. Playing with our Fisher Price toys--house, garage, farm-- my brother and I would play and not argue. I received a tea set one Christmas. It was metal as I recall. Loved it and I think it spawned my love of tea to this day. Thanks for a chance to win your giveaway. Our dad was a factory worker, so some years were more fruitful than others.So when we (the girls of the family) got beds for our barbies, they were very special. It was shortlived though.A neighbor little boy was visiting with his mother, thought they were seats and sat on both of them and broke them. They were never replaced.All we had left of them was the plastic matress that went with it.The dark haired barbie that I had, which was an original, was later stolen.